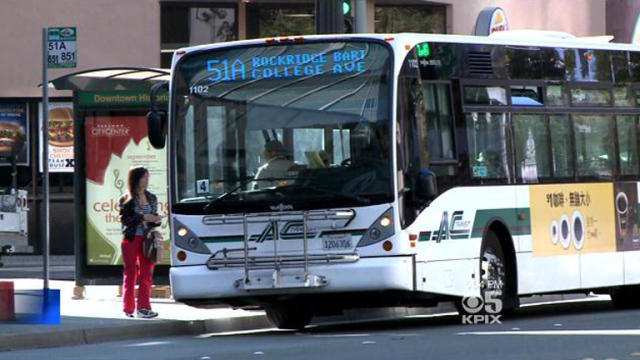 Many Tech students rely on AC Transit to get them to and from campus. We’re served by a number of AC Transit routes — such as 12 and 51A — as well as special school routes in the 600s. Check out route maps and schedules. Students age 5-18 are eligible for a $20 AC Transit monthly bus pass that can be loaded onto a Youth Clipper Card. Get details and the application here. Submit feedback online any time or connect to an AC Transit Customer Relations Representative, Monday-Friday, 6 AM to 7 PM, by simply calling 511 and saying “AC Transit”. The two BART stations closest to Oakland Tech are MacArthur and Rockridge. Check out the BART website for train schedules. Oakland Tech does not provide parking for students or parents during the school day. Students who drive must park on the street and not in the back parking lot which is reserved for faculty and staff. The City of Oakland will cite all cars on campus not displaying a valid parking permit. Two-hour parking is strictly enforced by the city around campus. Tickets may even be issued if a car leaves and returns after two hours. Copyright 2015 Oakland Technical High School; all rights reserved.